Revenue in the Bottled Water segment amounts to US$184,915m in 2019. The market is expected to grow annually by 5.8% (CAGR 2019-2023). In global comparison, most revenue is generated in China (US$49,632m in 2019). In relation to total population figures, per person revenues of US$25.12 are generated in 2019. The average per capita consumption stands at 61.6 L in 2019. The segment consists of both carbonated and non-carbonated water which is sold in bottles or via water dispensers. Various regulations at European and national levels define mineral water as natural ground water. Its composition and other characteristics must remain constant between certain tolerance levels. As a healthy alternative to soft drinks containing sugar, the mineral water market has shown the fastest growth in the Non-Alcoholic Drinks segment in the last few years. However, the availability of clean drinking water and increasing concerns about the sustainability of beverage packaging may limit the growth in some markets. Globally important producers in this segment are often rooted regionally near the source of the water e.g. Nestlé (San Pellegrino, Vittel, Arrowhead et al), Danone (Volvic, Evian et al) and Coca-Cola Corporation (Bonaqua and Apollinaris). The market for Bottled Water is structured into off-trade sales (in stores), on-trade sales (in bars, restaurants etc.) and bulk delivery sales, often called home and office devlivery or HOD (for water dispensers or coolers in offices or public spaces). Statista values off-trade sales at retail prices and on-trade and bulk-sales at wholesale value. Additional markups for hospitality services are therefore not taken into account. Reading Support Revenue in the Bottled Water segment amounts to US$184,915m in 2019. Reading Support The Bottled Water segment is expected to show a revenue growth of 6.4% in 2020. Reading Support The average revenue per person in the market for Bottled Water amounts to US$25.12 in 2019. Reading Support In the market for Bottled Water, volume is expected to amount to 501,522.7 ML by 2023. 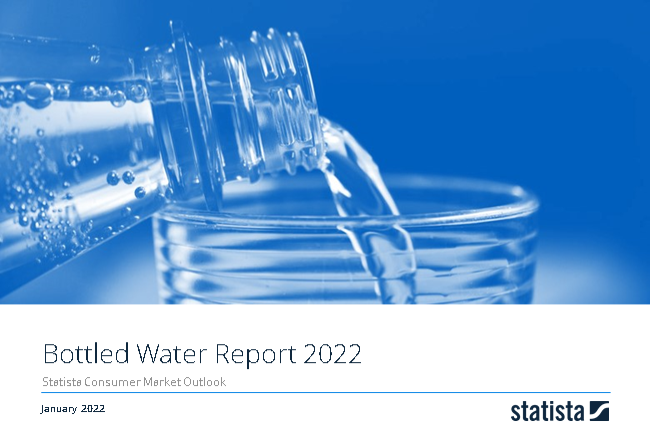 Reading Support The market for Bottled Water is expected to show a volume growth of 2.8% in 2020. Reading Support The average volume per person in the market for Bottled Water amounts to 61.6 L in 2019. Reading Support The average price per unit in the market for Bottled Water amounts to US$0.4 in 2019. Reading Support With a market volume of US$49,632m in 2019, most revenue is generated in China. Here you can find more studies and statistics about "Bottled Water".